It might not have been the results he was hoping for, but Andrew Holcombe put on a solid showing for the USA with a fifth-place finish at Austria’s Adidas Sickline Extreme Kayak World Championships. In a tight final on the legendary Wellerbrücke course, German kayaker and Beijing Olympic gold medallist Alexander Grimm kept up his winning ways by taking first. Grimm finished just 68-hundredths of a second ahead of New Zealand’s Mike Dawson and Jakobus Stenglein from Germany. 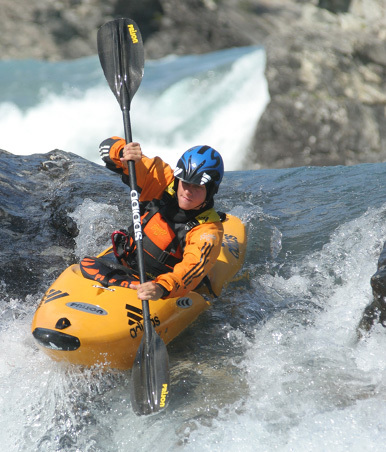 Over 100 top kayakers from twenty-two countries, among them Olympic Champions and World Champions in canoe slalom, had travelled to Austria to compete in one of the most difficult extreme races in the world. In a new race format, the day started off with two rounds of head-to-head heats. The new knock-out system ensured that the midfielders had a fair chance to get decent rankings, while ensuring that the fast guys didn’t battle each other until the final round. As a result, the Superfinal line up of 15 was the best of the best. First to launch in the Superfinals was Frenchman Fabrice Pouyeto, whose time of 1:04.05 secured him a seat in the Softub Whirlpool to enjoy a beer with Miss Tirol, Christina Keil. His time wasn’t beaten until six runs later by last year’s champion, Thilo Schmitt, who crossed the finish line in 1:02.16 — and then also took his place in the hot tub next to Miss Tirol. In his first extreme race ever, Grimm launched next, glanced a rock in the straights, and then used his Olympic training to finish in 1:00.46.